Jo, thank you. I have started submitting work, and I am using also using excel. I was play with how to format the spreadsheet and what to include. I’ll be refining based on your post. Glad to help, Jules. Good luck with your submissions! Excellent!!! Thanks for sharing. I’ve been using only word, but now I’ll switch over to excel seeing that it’s much more organized this way! No problem! I’ve found Excel makes it really easy to keep track of everything. No problem, Elle. I’m glad you found it to be helpful. I generally do it in a daybook file. I used to use a real book, but these days I enter the date, the ms title, where it went and what (exactly) I sent (ie synopsis+3 or full ms). Then I log ack. rej or acc and such details as contracts. I use the same system for Affordable Manuscript Assessments clients. I log date, email address, client name, ms name, assessment sent + account, and then PAID. It works OK except when for some reason an assessment doesn’t get where I sent it. Usually I have proof of sending (“sent email”) but recently it was a very old posted one… that’s one reason AffAssMss no longer accepts hard copy. It makes it so much easier to keep track of everything when you have a system. That’s a good idea to include what was sent (ie synopsis, etc.). 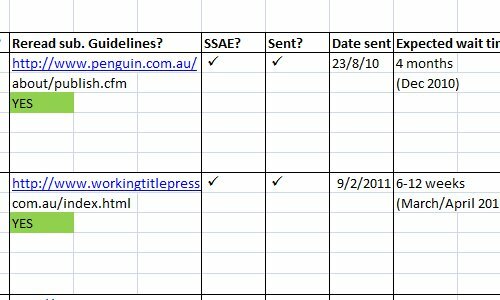 At the moment I’ve just got the file set up for PB submissions, so I always send full MS, but that’s a good point to keep in mind for when I start subbing my MG and YA work. This is excellent. I’ve set up a spreadsheet in excel for my agent search, but it isn’t this detailed. I really appreciate the extra things you have added and will amend my spreadsheet accordingly. I found it really helps to have all the different sub-headings to keep track of everything. I hope you find it helpful,too, when you add them in. I’m glad to have helped! thanks for sharing. i will save this for reference later. good luck with your submissions! No problem, Darshana. And thank you! Yes! Good luck with your submissions. This is a great idea. Wow! Great work! This system is amazing. Thanks so much for sharing. I have a question for you. Do you submit directly to publishers only to to agents as well? Thanks! Thank you, Elizabeth! It works well for me, so I’m happy to share. I’m only submitting to publishers at the moment. In Australia most publishers accept unsolicited manuscripts. As agents who rep picture books are very very rare here, I felt it made more sense for me to submit directly to publishers. If I decide to submit in the U.S. I will query agents there. What a great model. Thanks for sharing! I haven’t submitted in a while but I’ll have to keep your excellent system in mind for when I get back to it. Thank you, Laura. I’m glad people are finding it helpful. What a great spreadsheet with everything on it. Thanks for that. Will refer to it for my own. No problem. Glad it could be of help. Thank you-I’m willing to try this. I have a “paper” trail which isn’t pretty! It’s certainly helped me to have everything in one place an easy to access at the click of a button. I hope you find it just as helpful. Thanks for sharing this. I’ve kept a submission tracker that was slightly different, but I like the information you included in yours, especially the links to writer’s guidelines. I’ve been printing them up, this will be so much easier to keep track of. I’m going to incorporate this into what I’ve been doing and hopefully be able to keep better records of my submissions. Like you, I need to send out more and stop ho-humming around about it. It’s definitely made it easy to keep track of everything since I set it up, and having the links to the guidelines means I can access them with just a click. I’ve found it’s better than printing them up or saving in a Word document, too, since guidelines can change. I hope it helps you with you submission process. Good luck! It’s so easy to hold back and procrastinate, isn’t it? Confidence and determination! That’s going to be my motto this year. Super. Have bookmarked it as I launch the agent search over the coming months. It is more detailed than I would have begun alone, so very helpful. I’m so glad you found it to be helpful. Good luck with your agent search over the coming months. This is a great spreadsheet! I have something similar for agents, but one thing I like about yours is that it also serves as a checklist. I’m now inspired to create my own checklist. I use QueryTracker which is an online tracking method, but I like having your own desktop version too. Thanks for sharing! Glad I could inspire you, Julie. I’ve found it’s really helped with the submission process being able to check things off. I’ve never tried QueryTracker. I didn’t submit much last year simply because I didn’t think it was good enough. This year I have a ton of stuff and I’m going to take the leap and start sending it out. My record keeping isn’t the best so thanks for this post. I had that problem, too. I didn’t end up submitting much because I was worried it wasn’t good enough. I’ve got a few polished pieces ready to go, though, so I’m taking the leap, too. I hope this checklist is helpful to you as you submit. Good luck with your submissions! I’ve used your tips to develop a system. I’ve been trying to process how to get it all done, and this really helped! You’re welcome! I’m glad you were able to find it helpful. And I thought I was organized! Whew, girl! Good job! Best to you as you continue to submit! I’m not so organised in other aspects of my life lol. But this spreadsheet has really helped me stay on top of things when it comes to submissions. Thank you! What a great system you have put together! I definitely hope to get this organized with my own submissions. thank you for sharing with all of us! No problem! Good luck with your submissions! I really get bogged down in the organization part of all this. It can be overwhelming when you are trying to write, submit, keep track, etc. You have give us a system! Thanks for sharing. I agree, it can be totally overwhelming, I don’t know how I would manage to keep track of everything without my spreadsheet system. I’m happy to share it! Whew! This post got a few replies! I got out of breath just scrolling down to leave my comment. I’ve a very similar spreadsheet for agents, only mine’s a table in Word instead of Excel. Excel would make things more flexible (unlimited span of cells), but I like that Word limits the options – keeps me from more insanity. Might need to put together one for short stories – although with only two I’m trying to submit, they’re fairly easy to keep track of at the moment. If I do put one together, I’m definitely coming back for some of your story-sub headings, to see what I might need! I know! I’ve had such an overwhelming response! I found Excel worked best for me as it was easy to set out and easy to look at. Funnily enough, I use a different system for my short stories, which isn’t nearly as easy to keep track of (I was actually surprised by an acceptance on one of my stories last year because I’d forgotten I’d submitted it). 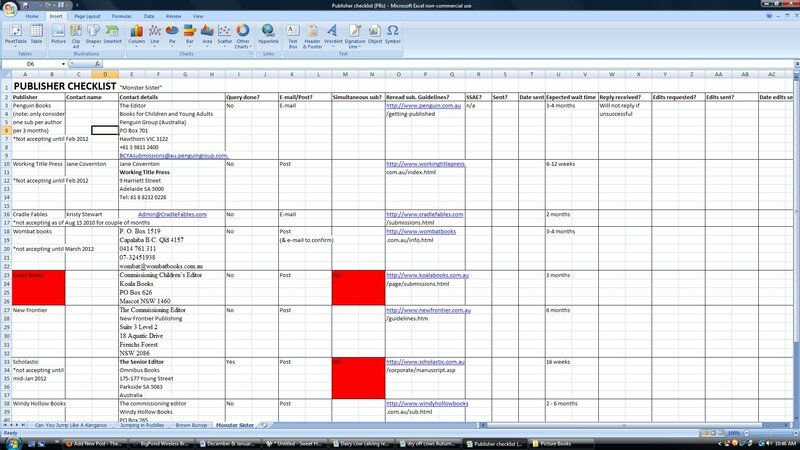 I should set up another spreadsheet file similar to this one for my short stories. Thanks for the prompt! Oh dear, I hope you can figure out how to fix it. I wish I could help you, but I only know the basics of Excel myself. Hi. Thanks for the heads up. I checked my blog on Internet Explorer and it appeared just fine. Could it be a problem on your end? I appreciate you commenting to let me know about it. Jo, I use a very similar Excel spreadsheet. However, I’m going to add add some additional columns that mine didn’t contain. Thanks for this outstanding resource. You’re welcome. I’m glad you could find it helpful. Really great resource. Do you have this file available for distribution? Thanks Enzo. I don’t currently have it available for distribution, unfortunately, but that’s a great idea and something I can look into providing in the future. Thanks very much for sharing. I just used your resource as a guideline for further developing my own and putting it in Excell format, which is a challenge in itself! Glad it could be of help. Once you get your head around doing it as a spreadsheet, it makes things so much easier to keep track of, so it’s well worth doing (at least, it has been for me). I’m working on a template to share (I just need to time to do it at the moment).